Blending Limerick street-slang and Cork lingo into cowboy, pirate, gangster, and Celtic archetypes to unleash mayhem and murder in a decaying Irish seaport 40-odd years from now, Kevin Barry’s debut novel builds upon his successful short stories to mark him as a talented teller of a very tall tale. 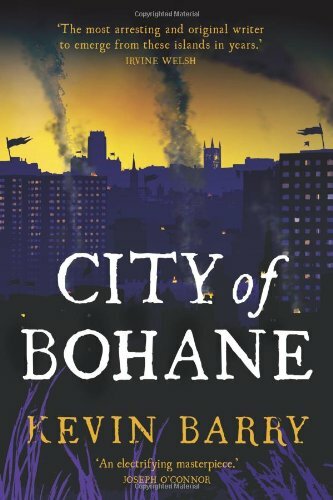 The scope of City of Bohane, on a fictional western peninsula facing the Atlantic, enables Mr. Barry to channel his island’s traditional lore of windswept bogs, garrulous lowlifes, and mordant humor into a place wide enough to let his cinematic visions recalling Gangs of New York, Mad Max, and A Clockwork Orange to contend against narratives from forebears such as satirist Flann O’Brien, who sent up in At Swim-Two-Birds similar Western showdowns against a backdrop of goats, tramps, and shifty fellows. Mr. Barry adds considerable amounts of violence and far more explicit vocabulary than could be given to O’Brien in a national climate once infamous for censorship. For the post-apocalyptic, feral streetscapes of Bohane, where a “lost time” has ended and something dreadful has happened that by its never being explained remains all the more effective, street justice rules. Honor among thieves is the motto as much as the city’s newspaper’s masthead: “truth or vengeance.” No cell phones, no Internet, no account of what has happened worldwide is revealed. There is no international exchange in this port outside of a wine bottle or photographer’s developing fluid smuggled in from Portugal. In this society, it is as if the seventeenth century has returned, and an Irish port again opens up to piracy, duels, and treachery. Logan Hartnett has long ruled the Fancy, the local crime gang. His wife, Macu, finds her loyalties challenged when an old flame, the Gant Broderick, returns to the city after a mysterious and prolonged exile overseas. Jenni Chang, all of seventeen in a catsuit, makes her own bid for power. Grudges linger and betrayals ensue. Meanwhile, the city’s police, press, and meddlers watch to see how the Fancy fares against the upstart Norries and the sand-pikeys, one from the city’s projects, one a tribe from the nearby dunes, who as if fops dressed in finery challenge with knives, chains, and boots the reign of sartorially impeccable Logan and his Fancy squad who try to keep control of their corrupt gains. What they control is quite altered from today’s Ireland, if cleverly extrapolated from contemporary demographic and cultural trends changing the island. Calypso and dub, fado and ska dominate the sounds heard from the Norrie high-rise flats and the Smoketown slums by the river. The Big Nothin’ extends north of the Norrie turf into the hinterland, where an almost tribal regression has occurred. The few enjoying wealth live in Beauvista’s mansions downtown, but the images of coriander, curry, Chinese brothels, drug dens, butchers’ remnants and brewery smells, tropical heat and Caribbean costume makes this a multicultural city in the west of a dystopian Ireland that displays Mr. Barry’s verbal and visual imagination. This passage demonstrates the familiar setting of a bog, but altered by poppy cultivation, and desiccated to emphasize its Western qualities of a flat land far away from the Atlantic fringe. Mr. Barry, as in his earlier stories, explores big men left to wander along a diminished island too small for their ambitions. As in his previous collection, the tales told here also mark such as the fado, sounds of a changed Ireland. “Who’s allowin’ who to live?” One character asks the question which pervades this lively saga. It follows the themes of a Sam Peckinpah revenge film or Sergio Leone spaghetti Western. That is, the weather-beaten if well-dressed hardmen line up, enemies are bought out, challengers are tricked, and callow rivals eliminated as vengeance follows the elision of truth. Criminals fill every drinking establishment and house of ill repute with their boasts, their whispers, and their regrets. Mr. Barry chooses to tell his narrative by an oddly in-the-know figure, who is rarely glimpsed, an archivist of old film reels from the “lost time,” and how this person knows so much from all over is not explained. The adjustment necessary to enter this upended, predestined story fully—told in a formidable pastiche of Irish slang mixed with perhaps a reggae-meets-“chav” spin on what is a ghetto-gypsy-globalized patter—demands concentration. As with his short stories, memorable language and restless characters remain Mr. Barry’s strength sometimes more than plot, structure, or originality. Some suspension of disbelief, as in a tale of ancient adventure recounted by a bard, may suffice to move the reader along its time-tested, familiar path. The partly predictable direction that this plot follows regains vigor in the style of its wry, filthy, witty, intricately unexplained argot. This command of jargon infuses a fresh, bitter, bracing quality into this ambitious mash-up, set in such an oddly half-familiar, half-distorted place as Bohane—half on the Irish coast, half in a timeless Western saloon. John L. Murphy, Ph.D. coordinates the Humanities sequence at DeVry University in Long Beach, CA. He researches medieval and modern literary, musical, religious, and popular culture.